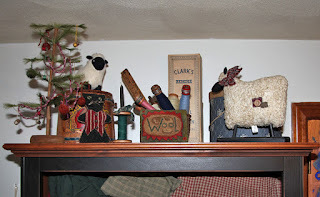 Free stitcheries and thrift finds! 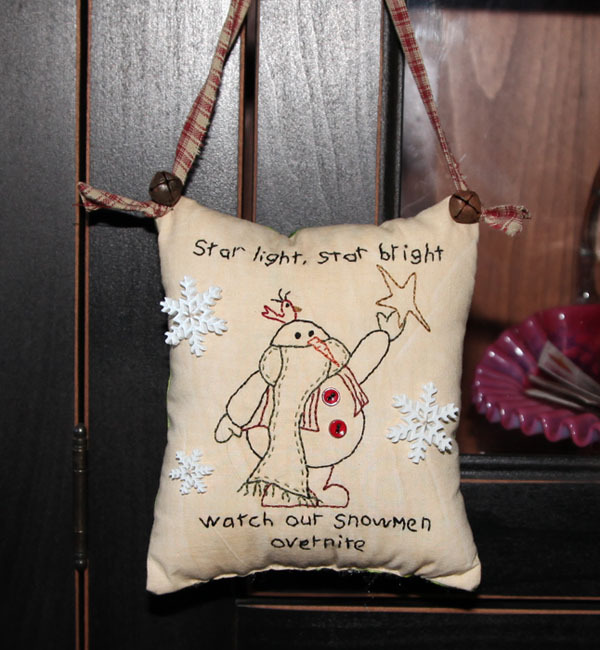 Christmas Pillows From Free Designs! You have all made my year special and each day a celebration of friendship. May God bless you and your family with Love and Health in the coming year! Stray kitty who has been sleeping in my basement stairway, the last two days. 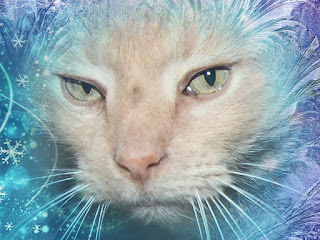 If you would like to decorate your own photos, you can visit Art.pho.to for free editing effects. 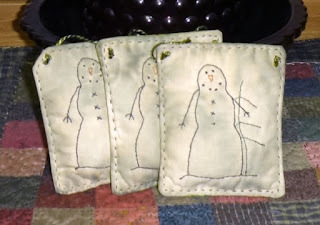 If you enjoy doing stitcheries and learning new techniques and stitches, you should visit Mary Corbet's blog. Her posting are full of inspiration and tutorials and she offers free patterns. 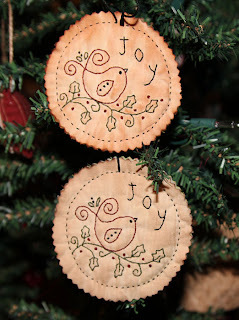 Last week she did a Christmas piece with the word Joy and I just had to try it. I love how it looks and it is a great gift to make ahead for next year. I made mine into pillows, but I did not stuff them. I might add balsam to mine, so I will leave them as is, then I can stuff them next year so they will have fresh balsam in them. Another idea for those of you who like to send items with a card, is to leave them flat with an opening so they fit in the card. Then the recipient can stuff them themselves. 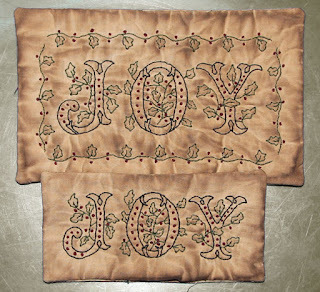 For the backs, I used the fabric, Christmas Traditions that I got with my gift certificate from This-n-That Fabrics. I love how it looks and it is great for pillow backings to give it that added touch. Another thing I love to do is shop in thrift stores, you never know, what you will find. 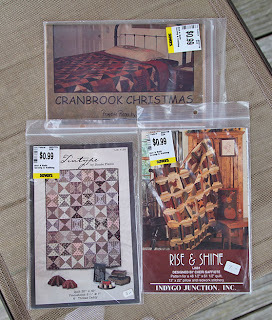 I found these three patterns, only .99 a piece, not a bad deal. And I found this guy on a shelf, love the raggedy look. 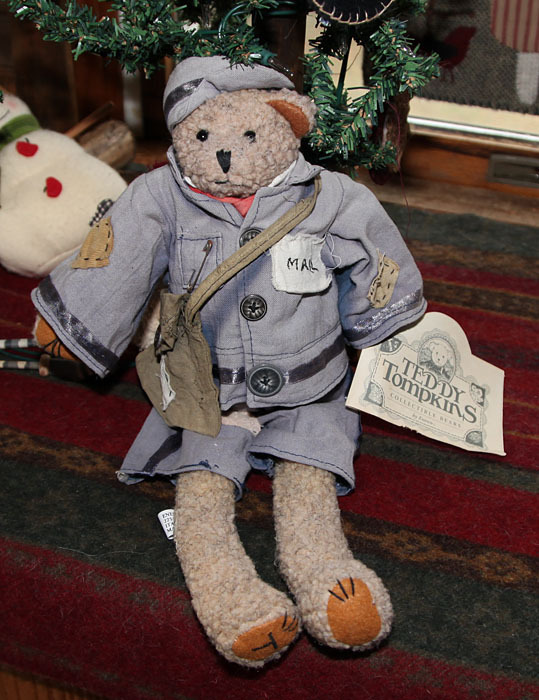 I assume he was left in the sun and it faded his mail suit, but I like the dull color and the worn look. Something fun to sit on a bench. We are finally getting snow, lots of it and everything is covered in white, I love it. I hope everyone had a wonderful Holiday and are safe from the storms that are hitting everyone. We are getting wet snow tonight, so not as bad as most areas. Good weather to stay in and work on projects and with all of the goodies from my friends and wins this year, I will be keeping very busy. 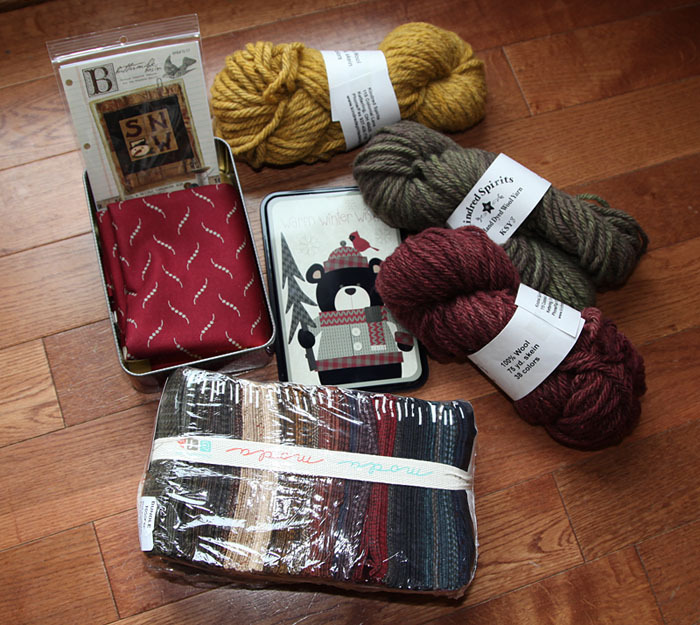 My friend Kelley, With Hook and Needle sent me a wonderful box. 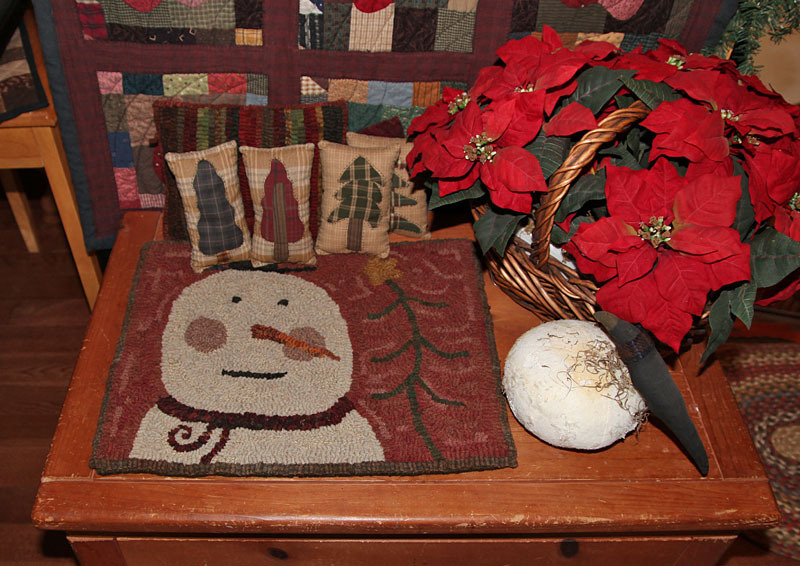 She made me this beautiful snowman rug, I love it, her work is amazing, she has a gift for prim hooking and her color choices are wonderful. She also sent me a package of the woolie flannels, I love those and I can't wait to make a quilt with them. A fun new pattern to make for next year and she even included a beautiful print for the piece. 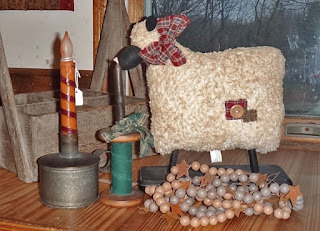 I love this wool, a real treat for me, have never had hand dyed wools before and I will use them in a special project. 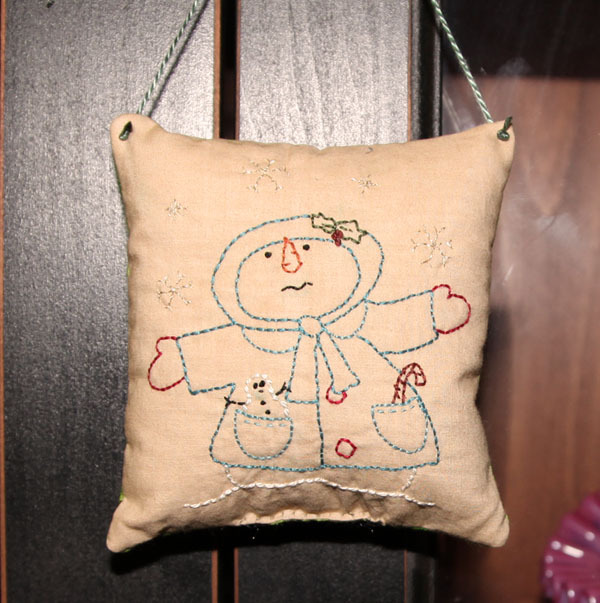 She also made me a wonderful christmas pillow, but I forgot to take a photo of it. I am looking forward to finishing projects and starting new ones this year. I was also the lucky winner of a bag from the Green Bag Lady. The bag she made is beautifully made and I love the fabrics. She makes bags from recycled fabrics to use for shopping and gives them away, as long as your promise to use that instead of plastic. I think it is a wonderful idea and a wonderful cause. I decided to give mine to my DIL and put her gifts inside the bag and then she can use it afterwards for her shopping trips. 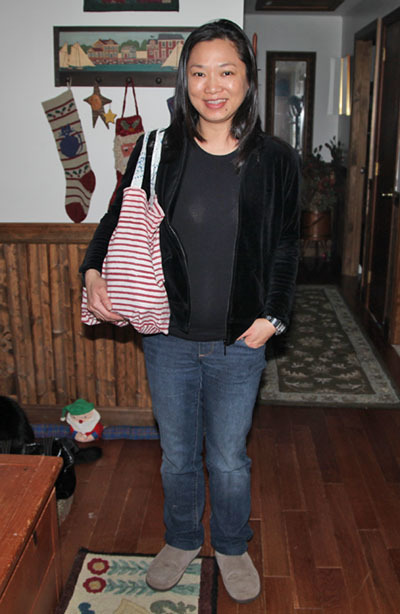 This is Ivy holding her new bag and carrying my grandson in that little belly, lol. Be sure to visit the Green Bag Lady and see how you can get a bag of your own. If you haven't placed a vote at This-n-That Fabrics yet, there is still 14 hours until the votes close. 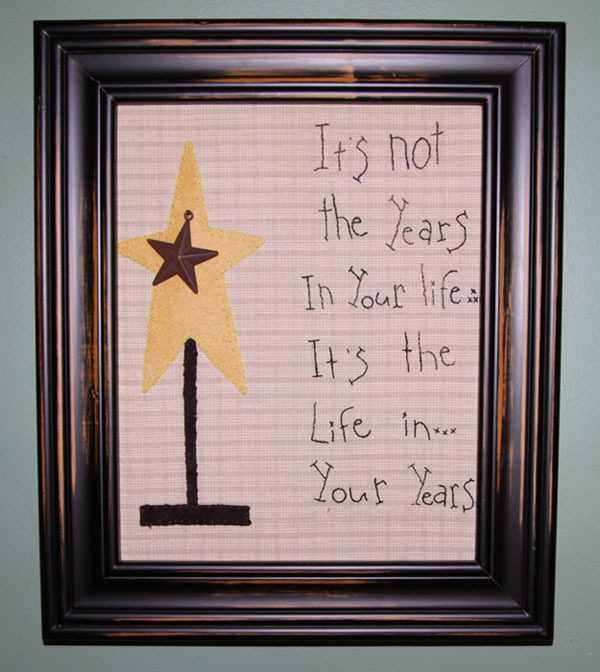 They are also holding another contest today for a free year of The Quilt Show, so be sure to visit. I wanted to try something quick and simple, so I made a little christmas piece. Nothing fancy, but if you need something for a last minute gift, this works up quickly. I did the snowflake with silver glitter floss. I messed up the drawing, and reversed it, so it came out a bit funky. But, it is simple enough to move the letters or change it up a bit. Also, I realized I forgot berries on the tree, duh. If you are still in the mood to do some stitcheries, Christmas Coloring pages has a variety of prim stitcheries that are free to use. 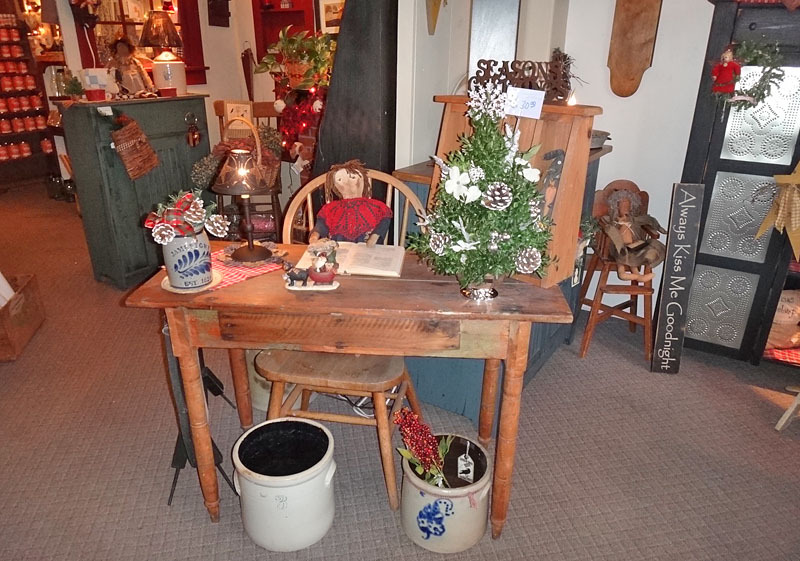 One of my favorite places to visit is Dearie Dolls. 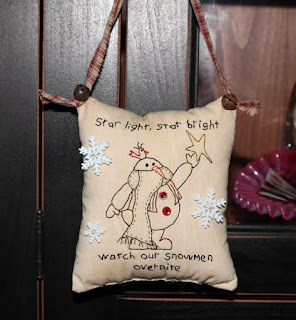 She has been posting her designs for free and this past month has put up a lot of wonderful Christmas designs. 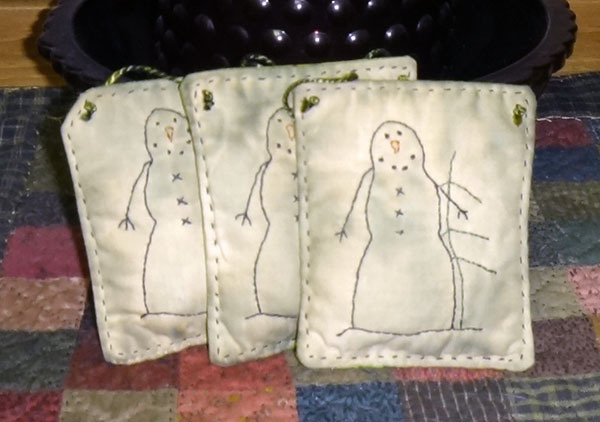 They are fun to make and a lot of them are in series so you could make a whole quilt with a set of them. You can also do a search for a particular type, try typing in snowmen, enough to keep you busy all year. 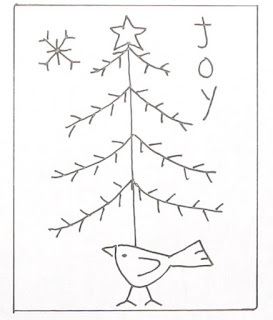 This one was from her series, twelve days of Christmas, he is two turtle doves. There were some extra critters in the design, but I kept it simple. The snowflakes are done with a gold glitter thread, I wanted to try a little sparkle. I added a hanger since this is for residents, I wanted something they can hang on a door or their bed. This one was a fun one to stitch, it just says happy and makes you happy as you stitch it. She has silver glitter thread for her snowflakes. VOTE NOW! The voting has started at This-n-That Fabrics for your favorite Christmas quilt. 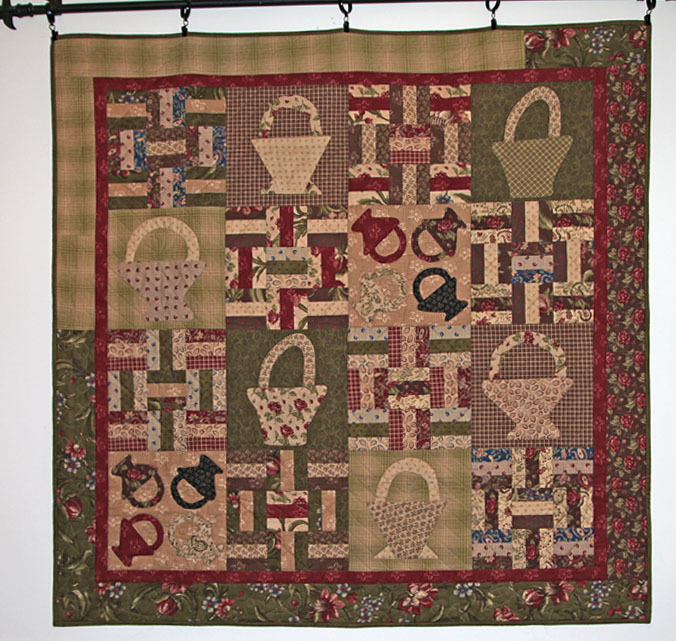 Be sure to visit and cast your vote for your favorite quilt, lots of wonderful pieces. 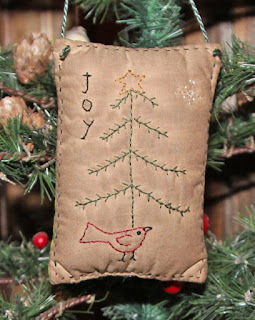 A few years ago, Jan Patek had a free pillow as part of the Christmas blog hop. Of course I had to mess with it and make it into a quilt. I finally finished it, though I am beginning to wonder if I should redo her hair and I am not pleased with the layout and how the letters sit above her. Usually I would antique something like this, but I might change some things, so I will leave it for now. I went back to the page for the pattern, but it is no longer available. A good thing to remember when you see something for free, get it while you can. I wanted to add the word peace and keep it simple. Then I decided to add hair, she does not look too peaceful now, lol. I think she needs a new hairdo;) I did a black outline stitch on the borders, then I decided to use my wool aurifil to do a stitch around the angel and then rays going out from that. With the recent tragedy is seems odd to title a posting with joy, but I feel that we all need to feel joy and bring joy to others. Joy is what fills our hearts with peace in a cruel world. One way to bring joy is to share it with others. I have been making small ornaments from a free pattern by Gail Pan. 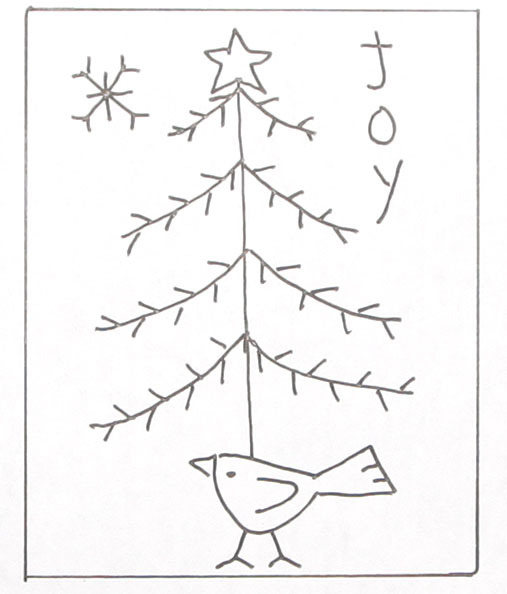 The original design has stars, but I decided to add the word Joy, to mine. I love how they came out and it is something I can hand out to patients in the nursing home who have no decorations or family to visit. A little something to hang on their door or bed, to remind them that someone does care. Another way to bring joy would be to donate to a giving tree or toys for tots. Another way to bring joy is to send a friend an unexpected gift, like a sweet little snow bird. Paulette of Sweet P Quilting and Creations sent me this snowbird, I just love it and it brings a smile to my face. I think I want a whole flock of them. 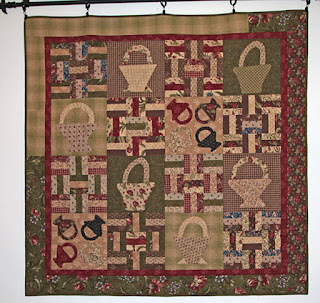 And another friend, Carole of Quilting Adventures sent me this beautiful quilt. I was totally surprised by this gift, one that is beautifully made and that she spent so much time making something so special for me. It brings joy to be able to have something on my wall to remind me of such a wonderful friendship. I just hope that my small gifts to others can bring them as much joy as they have given me with their friendships even if we have never met. I wish I had thought to get a better photo outside, before I hung it up, it is so beautiful and beautifully made with homespuns and printed fabrics. I had to crawl up a ladder since it is hanging above my entry door. I found these clip on rings at home depot, perfect for hanging a quilt on a rod. Last week I won a contest sponsored by Kelley of With Hook and Needle. 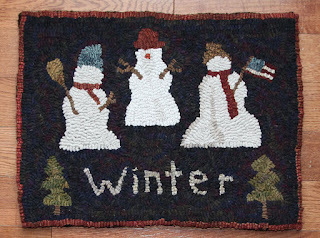 She had two snowman rugs to giveaway and I was the lucky winner of one of the rugs. I just love my new rug and it looks wonderful on my chest. Kelley has such a wonderful gift of hooking prim rugs and the colors do look wonderful in person. I also made some tree blocks last year and didn't know what to do with them, so I decided pillows would be fun and easy. I kept them simple and added balsam to each one, then put one in different areas of the house to get the pine scent since I don't have any real trees. I put them in the photo all together so you could see what they look like. It is something simple you can do yourself, just use patterns you have with trees and make them into little pillows. 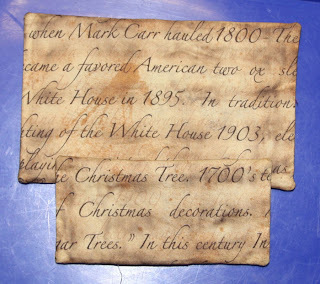 If you don't have a pattern, search the web for free christmas tree graphics. Great to put around the house or for bowl fillers. An added benefit is, you can have a tree that is cat proof. Another surprise this week was a gift from Anna of Woolie Mammoth. She surprise me with this beautiful framed wool piece and I love the saying. I decided to put it in my office to remind me to enjoy each and every day of my life. It is also a reminder of the friendships I have made through blogging. There are still 6 days left to enter the contest, sponsored by This-n-That Fabrics. 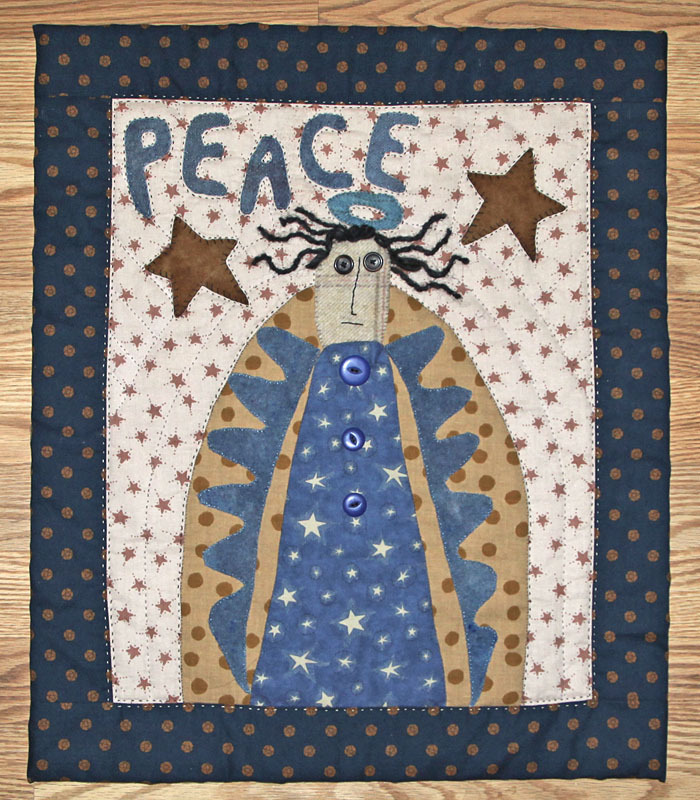 All you have to do is submit one of your christmas quilts that you made this year, easy as that. I decided to make a hanging pillow for my daughter. She has a new place and I wanted something she could hang on a door and add some holiday cheer. I also added Balsam so she could have the fresh smell of pine, to enjoy. I found the design online, but I can't remember where. If you do an image search, you can find lots of free patterns to make into pillows and ornaments. Coloring pages are also a great source and you can reduce the size of the larger ones. I didn't prim this one up, since my daughter likes bright and fun things. Another thing that has been going on is, we have a new visitor. I think this is a female and her bones are sticking out, so not sure who she belongs to and how old she is, but she doesn't seem to be in very good health. 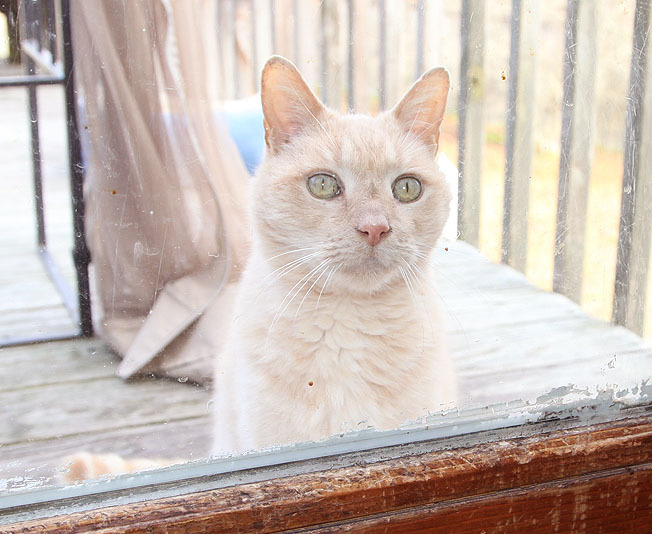 It breaks my heart to see her standing at my door every day, she sits there and looks in at my kitties, all snuggly and warm. We have been feeding her, but I need to find out who she belongs to and find her a new home. I have no idea if she has had shots and I have to be careful with my kitties, so I don't dare, let her in. Today I got a wonderful package from a swap on our primitive quilt group. We went with a pouch this year and I was definitely spoiled by Jeni of The Willow. 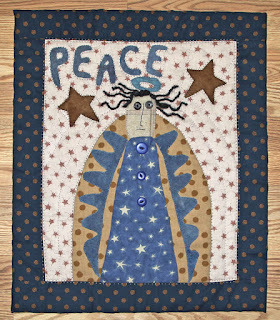 Jeni is one of the girls behind the new magazine, Primitive Quilts and Projects, my favorite magazine and the only one I subscribe to. There is always a few things I want to do in each issue and even if I only do two, I am still getting my money's worth in patterns and still lots of patterns I haven't had time to do, so it is a nice treasury of projects for the future. As you can see, Jeni made me a lot of beautiful prim items. 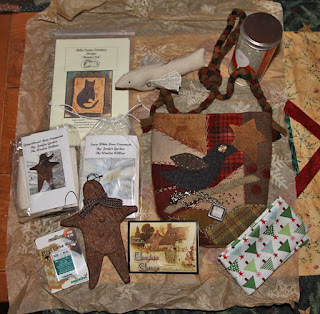 I love the bag and not only did she make the ornaments, she made up kits so I can make my own, so I have something to start for next years's gifts;) The kitty pattern is a punch needle penny rug and I had loved that when I saw it, she must have read my mind. I can't say enough, how much I love my goodies. 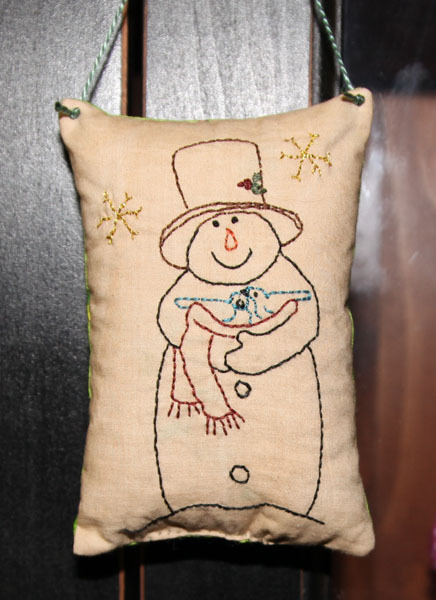 And the wonderful thing is, you can make your own gingerbread man with the free pattern from Primitive Quilts and Projects! I also received some beautful Christmas cards with a gift inside. Nancy of Tom Miner Quilts and Folk Art, sent me a beautiful woolie ornament to hang on my prim tree. I love it and I love prim ornies that I can hang on the small trees. Mary of Quilt Hollow sent me a beautiful mug mat, the photo does not do it justice, her stitching is beautiful, I would hate to ruin it with spilled tea. I also wanted to let you know about a contest being held by This-n-That fabrics. If you recall, I entered the fall challenge with my Gourdy's gang and won second place. 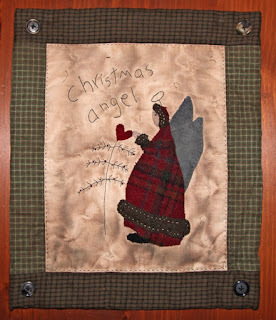 Now you can enter their Christmas challenge by submitting your christmas quilts and wall hangings. There is no reason not to and you get a chance at winning a gift certificate. I would really love to see my followers enter the contest and win a wonderful prize, so visit their blog and submit your Christmas entry. 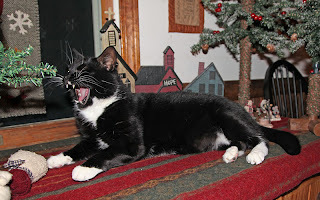 I haven't finished any projects this week, too buys decorating and redecorating, the fun of cats. Moki pretty much lives in his tree house, he sleeps there and keeps an eye on the outside world from his top perch. But, the minute I put up the trees he decides he wants to sleep on the bureau. 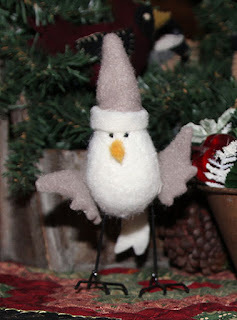 I want to put the chenille candy canes on them, but i know he will be pulling them off and pulling the trees down. "I want my Candy Canes!" I also did a new arrangement for my sewing room. I think it needs a vintage textile sign to go in back of it, another thing to make. I finished another Christmas mini quilt. This design was found in the book, Heart Warmings by Pieces from my Heart. I was lucky enough to find a copy at a thrift store for only two dollars. It has some fun patterns in it and I plan on making others, when I get a chance. I kept this one simple, and did a running stitch around the borders, then some snowflakes and ties to the middle sections. The background was a piece of muslim that I had stained years ago. I used tea, a mix of muddy paint and then an added walnut stain when I was finished. Looking for some new free patterns for Christmas? Check out the newest issue of Rusty Tin Roof's newest online magazine for winter. There are a lot of extra free patterns in this issue. I worked on some new stitcheries to add to my packages. I made some more flat ornaments and filled these with some balsam from Maine, I like giving my friends a touch of the north to enjoy in their homes. 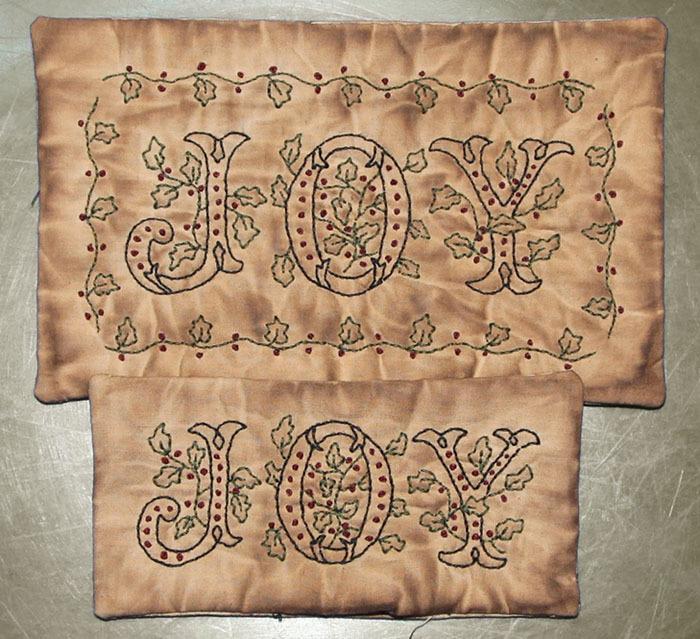 The designs for these came from an out of print book by Cheri Saffiote, Two Hour Quilted Christmas Projects. 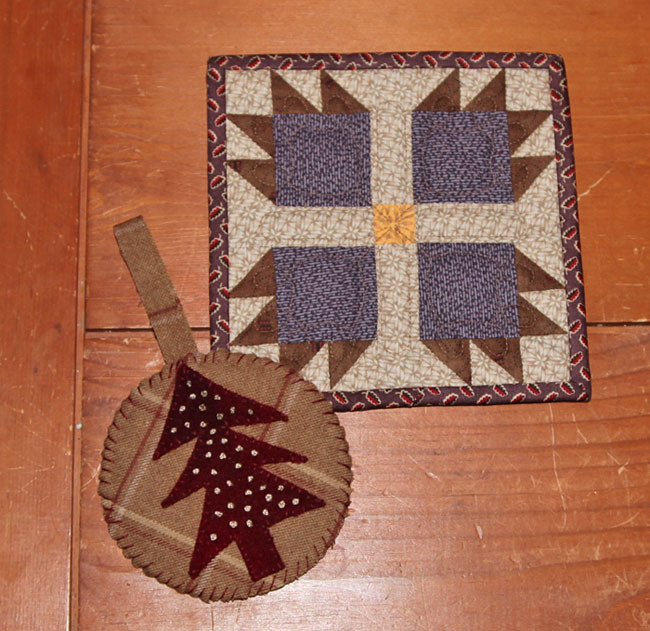 It is filled with wonderful designs to stitch or for appiques. You can get copies on ebay or used book stores, for under 5 dollars, if you keep your eyes open. I antiqued these and decided to add some of my java spray to make them more grungy. The pieces are a lot darker in person. Taken with my little camera, so the photos are not that great. 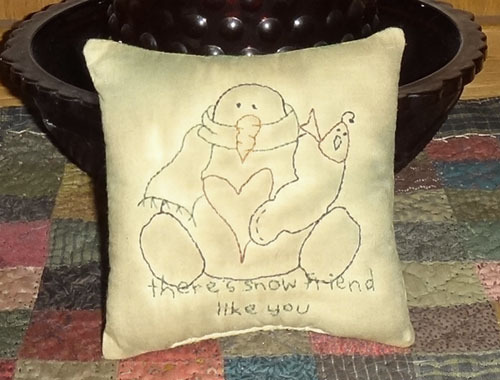 I also made a pillow, I love it when I find a free graphic with a friend saying. Unfortunately, I forgot where I found it. But, there are lots of freebies on the web, just use the image search and change up the keywords, to find different types. 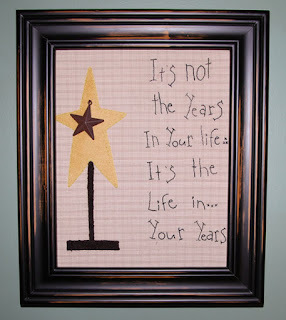 You can also visit Free Stitchin' Patterns, Sue has some new ones up today. Another site that I visit to find new stitcheries and patterns is Craftgossip. Every day the editors list new free designs for crafts and cooking. Yesterday was a cold day and we got snow and rain, so it was a good day to go shopping. I found a new store that I wanted to check out and had fun walking around the rooms, at least three times. The store is called Carol's Country Corner and she carries primitive and country goods. You could walk around a second time and see things you missed the first time, so a fun activity for a rainy day. There were a lot of wonderful prims and some antiques and I took some photos, but most came out bad or blurry. 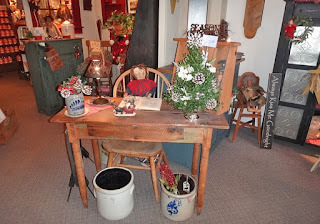 This was one of my favorite displays, wouldn't this set up, be fun in a corner of the house. 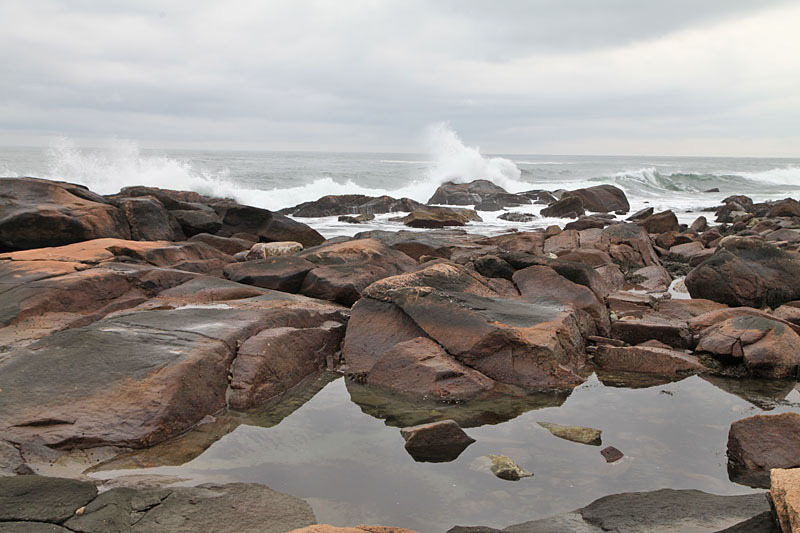 Today was beautiful, a bit cloudy at times and a bit of drizzle, but the rain stayed away and it was a lot warmer. We wanted to check out the area at Point Judith, where there is the lighthouse and fishing area with the breakers. This is what we found at the fishing area. 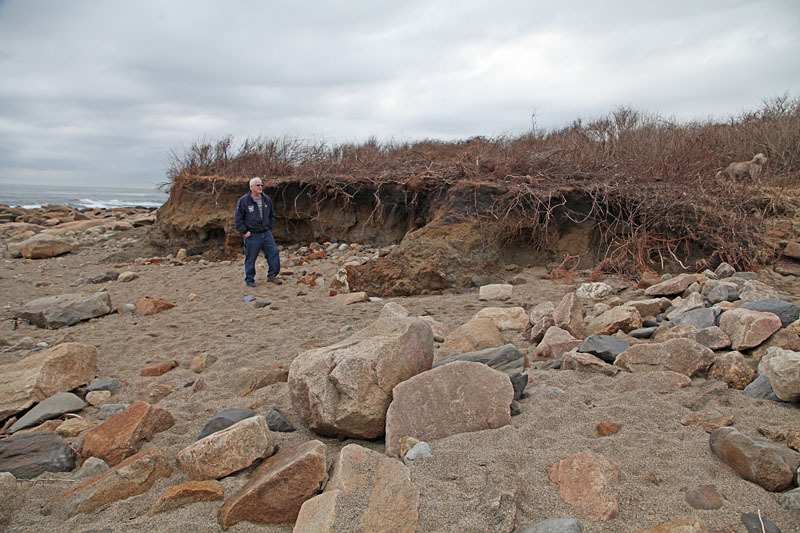 The area was deteriorating from some recent storms and hurricane Sandy did a lot more damage. This is the parking lot now, before it went to the sign, way in the back of the photo. 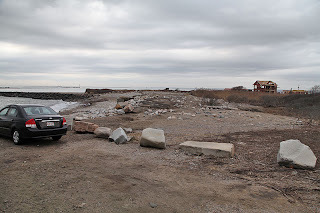 Half of the old parking area, is gone. We also went to Black Rock. 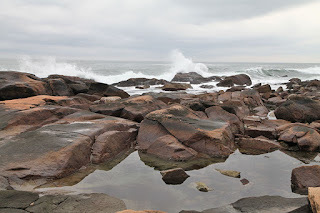 The high cliffs were fine, but as we walked, we realized all the bush was gone. Then we went onto the beach and saw why, the storm came up and ripped away at the land and took half of it, back into the sea and left more piles of rocks on the beach and the pathways. There was a lot of damage further up and areas where the path got taken down, but it is still a beautiful place to walk and enjoy the views. I hope everyone had a wonderful weekend.